Item # 308691 Stash Points: 499 (?) This is the number of points you get in The Zumiez Stash for purchasing this item. Stash points are redeemable for exclusive rewards only available to Zumiez Stash members. To redeem your points check out the rewards catalog on thestash.zumiez.com. Get in the holiday spirit while repping classic skateboard styling with the Toy Machine Ugly Sweater Red, White and Green Crew Socks. These festive socks feature signature jacquard knit graphics throughout that include snow flakes and Toy Machine minions. 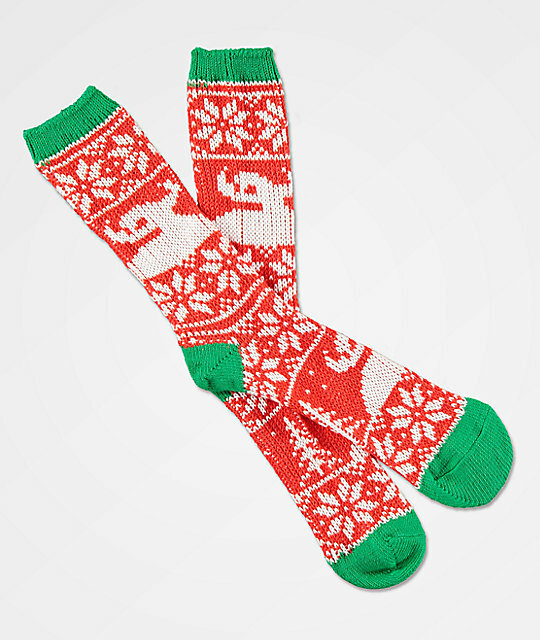 Ugly Sweater Red, White and Green Crew Socks from Toy Machine. Crew length with elastic ribbed cuffs. Jacquard knit logo graphic pattern throughout. Hand wash gentle, lay flat to dry.